So, you’ve decided to grow your business by asking your customers for referrals – but what do you say? We’ve shown some ideas below, but please don’t learn one and then just say that all the time. It is important to be open, honest and sincere – be yourself! It’s like networking where you get to stand in front of everyone for a minute to say what you do and what you are looking for. Except it’s easier in many ways! Many people we’ve met dread standing up in front of a group of people and speaking. They are the ones you see who have spent hours writing a script and often read it from a tablet or paper. 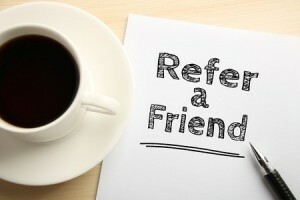 Asking a customer for referrals shouldn’t be something that intimidates you. You just need to be confident that they are happy with your product and service. If you are not sure what to say, check out the suggestions below but then develop your own. Get to know what the key points are that you want to make. Then practice until you are comfortable that you can ask for a referral as part of a normal conversation. First make sure that your customer is happy – if they haven’t already said so then ask them! Many people find this type of approach more comfortable than asking for contact details. I used to use this approach when I started selling until I gained confidence. The problem is that they can agree but then bin your cards as soon as you walk out of the door – and you will never know! It can be successful though – I once asked someone this question and he agreed. When I gave him 2 cards he immediately said that he would need more than that. When I asked him how many he suggested 30! – I was a bit hesitant as that was all I had left, but I did. Within 3 weeks he had referred over 30 new customers! If they do offer names, take a note and ask if they could introduce you. If they can’t think of anyone, at least you have planted the seed and you should still leave some cards with them. You may have noticed that both suggestions assume you are having a face to face conversation. This is because people are more likely to do something for someone else if asked face to face. Top Tip: Just do it! Once you’ve started, keep on asking for referrals. Don’t expect business immediately. It will take time but, over time, the more you ask, the more referrals you will get!